I’m BACK!! Yes, I know. It has been a while. I’ve been away in the Berkshires this winter at Shakespeare & Co. for their Shakespeare Month-long Intensive training program (remember I’m still an actor!) and there was no time there for anything even resembling cooking. We worked from 8:15am ’til 10:15pm every day, six days a week for a month, and let me tell you, those days were full to the brim. We only had an hour for lunch and an hour for dinner, which were prepared by the remarkable Ron and Carmen and their wonderful team. Ron is a trained chef, and his philosophy is to cook with fresh, local ingredients as much as possible. Of course in Massachusetts in January, the fresh, local-ish produce was an eclectic assortment of root vegetables and lots of kale. LOTS of kale. There was a LOT of kale. Which I love. Which is a good thing, because there was a lot of it. These kitchen warriors created wholesome menus that catered to all manner of diets: vegetarian, vegan, gluten-free and kosher. There was Greek night, taco night, some of the best fried chicken I’ve ever had, Indian night, Asian night–just meal after meal of delicious food. Oh–and cookies. And cake. There was dessert either at lunch or dinner (whenever we were gonna need it most), amazing cakes and brownies to celebrate birthdays (or just because, and wonderful chocolate chip cookies that transformed into crispy/chewy/chocolatey discs of Nirvana after 7 seconds in the microwave. And there was always at least one and usually two homemade soups. On our one day off in the week, there was only brunch (waffles and bacon!) 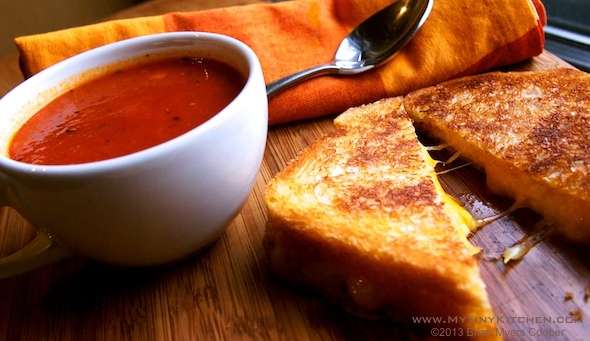 and a more casual dinner of grilled cheese and homemade tomato soup, which suited me just fine. 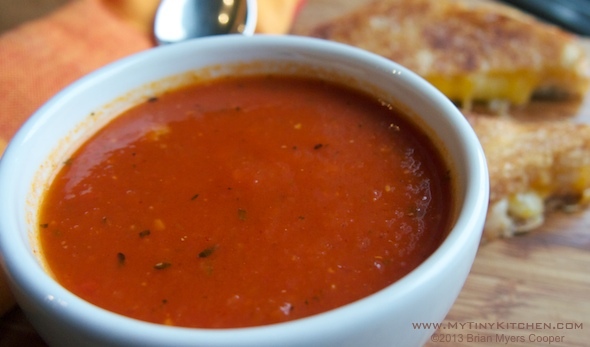 Tomato soup has been a favorite of mine since I was a kid, always paired with grilled cheese cut on the diagonal (it tastes better that way, I swear!) Mom used the gloppy concentrate in the red, white and gold can Andy Warhol made famous, mixing it with milk to make the cream of tomato variation. When I got on my own, I branched out and found that I preferred using water for the straight-up-tomato-soup. And when I ditched the milk, a whole new world opened up. I started adding all sorts of new flavors to punch up the flavor – salsa was my favorite addition, but cheese, cheesy crackers, fresh onions & garlic, and all manner of herbs were all fair game. Life was good for many years until an ad agency came up with the idea to make personalizing their tomato soup into a big ad campaign. Then EVERYONE was putting salsa and cheese in their soup. That was when I started looking for something new. I tried some of the more upscale, not-from–concentrate soups that had popped up, and they were fine, but I was still dissatisfied. Then it hit me: I could make my own tomato soup! And I did, and I never looked back. So on our first day off at Shakespeare & Co. when I saw that slightly chunky (“rustic” I call it) homemade tomato soup beside a pile of grilled cheese sandwiches, I knew I’d found culinary kin. I was so grateful for Ron & Carmen’s frugality (side dishes that became soup the m=next day! ), inventiveness and commitment to using fresh, nutritious ingredients because they always taste better. You can find some of the recipes (well not recipes, exactly, but lists of ingredients) in quantities to feed 70 hungry actors on Carmen’s blog. Thank you, guys–you ROCK! This is my tomato soup, or at least the basic version of it. Once you try it, you will never open a can of tomato soup concentrate again. It’s supremely easy and full of actual tomato flavor (must be all those actual TOMATOES!) You can personalize this one, too. In fact I demand that you do. DO IT! And share your favorite variations with me so I can enjoy your ideas! In a heavy sauce pan, sauté the onion in the olive oil over medium heat for 3-4 minutes. Add the garlic and sauté for one more minute. Add the white wine and allow to reduce by half (about 2-3 minutes). Add the tomatoes, sugar, salt, pepper and cinnamon. Get out your immersion blender and blend until smooth (or as smooth as you like it; personally I like it a bit rustic.) You can use a regular blender or a food processor, but work in batches and be careful to cover the lid of the blender with a kitchen towel to prevent messy splashes. NOTE: If you use CRUSHED tomatoes, you can avoid the whole notion of blending altogether, but I think that chopped or whole canned tomatoes have a better flavor and texture, so I blend. You can play it however you like! 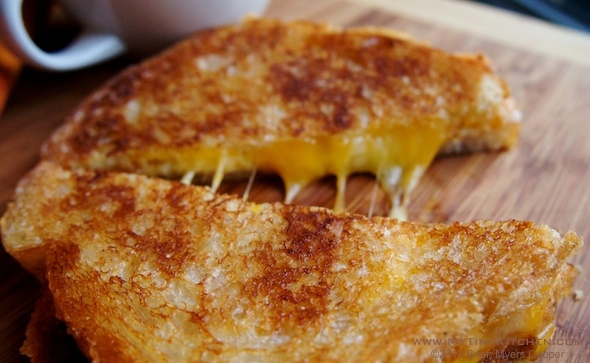 You’re going to the trouble to make homemade tomato soup but you’re not going to make grilled cheese? What planet are you from? Return the tomato mixture to the pan over medium heat. Add the water to create the consistency of soup that you like. I like it pretty rustic and thick, so ⅓ cup is just right; adjust the amount to get it the way you want it. Add the thyme and basil. Bring to a simmer, lower the heat and cover. Simmer for 10 minutes. Turn off the heat, taste and adjust your seasonings. Let it sit covered and off the heat while you make the grilled cheese (you are going to make grilled cheese, right? RIGHT?). It will stay plenty hot, the flavors will continue to meld, but you won’t overcook the tomatoes–you really don’t want to break them down to the point of tomato sauce; it’s nice to have a bit of that fresh tomato flavor! Brian, Love this! My brother lives in Lanesboro and we grew up on Campbell’s Tomato with grilled cheese (growing up in Springfield it was on Dreikorn’s White Bread and of cours cut diagonally! (and with mustard on top of the buttered slice!) I drink a whold can (made with water) when I feel a cold coming on! It usually stops it in its tracks. Definitely will try your recipe! One of my fave meals! Made this on Monday evening (with the grilled cheese, of course) when it was cold and rainy in Phoenix and I was in need of comfort food. Perfect. My personalization was to add a tsp of McCormick’s California Style Lemon Pepper and cut the salt in half. And you’re right, I’ll never go back to the can! And I once again, a great narrative and awesome photos!